The [Country] faces an unprecedented danger as the [Yato] attack the [Seiken] (Government Sword). As the Prime Minister, command your [Spirits] (Government Spirits) into [Battle] (War Election) to defeat the [Yato]. 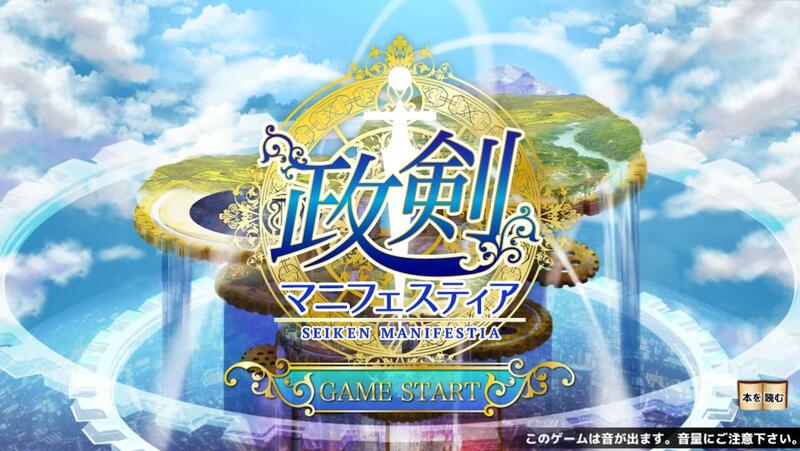 Seiken Manifestia is a real-time strategy 'tower defense'-like game that involves summoning and moving units through a map to take territories, defend them from enemy units, and destroy the enemy castle. Gather a party of up to six Spirits to help reclaim the country from the invasion of Yato. This post is curated by @Folseus. Please @ me with any questions or clarifications. The top of the page shows your basic resources. Motivation is your basic stamina required to sortie to maps. The time to recover 1 (one) is shown counting down, followed by your local time of when it is expected to be fully recovered. It takes 5 minutes (300 seconds) to recover 1 Motivation. In this screenshot, I have 113 Motivation out of 223, there is 206 seconds left until my next 1 Motivation recovers, and a full recovery is expected at 08:33 AM. The time used is your local system time, and not JST. Your current Rank is shown and the EXP required to next level with a progress bar. Leveling fully recovers your maximum Motivation and it will overflow if you have extra. In this case, I have 2596087 EXP left before I level, where I will recover +255 Motivation. If I leveled right now with my 95 Motivation remaining, I would have 350 afterwards. Gold is used for Normal Gacha, Affection unlocks, and Abenomics (Refinement). At least 5x Gacha tickets are required for one Premium Gacha roll. Your Starting Mana for when you Sortie is shown, and increases when you level. Battle: allows you to enter combat. AKA Sortie because we're a mainly KanColle forum. Unit: shows you individual stats of each Spirit you have, their rarities, allows you to improve Affection, and set your secretary. Party: allows you to set up your parties, selecting up to 6 Spirits, and setting their current rarity. Item: shows all the items you currently own, and lets you sell the ones meant for Gold. Includes the shortcut to the Shop where you can purchase items for DMM Points. New Spirit Gacha - (Deprecated?) 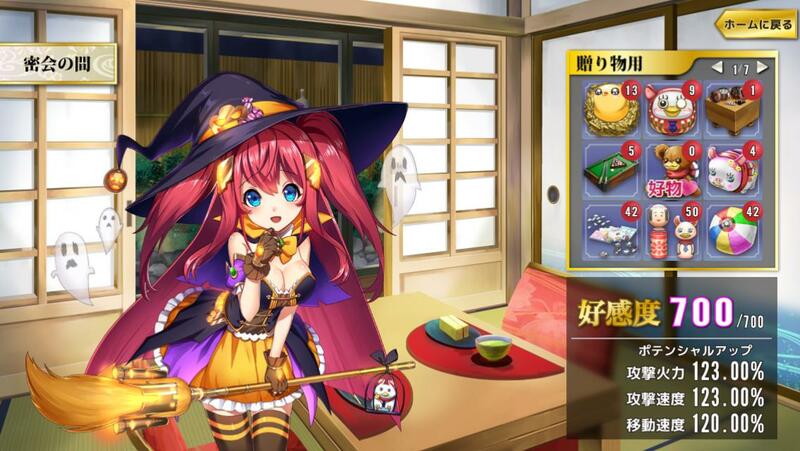 When a new Spirit is added to the game, she appears with pickup (increased chance) for a week in this gacha. You can use Gacha Tickets, or DMM Points to roll. Step-up Gacha - When a new Spirit is added to the game, there is a step-up gacha. This gacha has multiple tiers of guaranteed bonuses, typically starting with SR Guaranteed, then new Spirit SR Guaranteed, and ending with new Spirit SSR Guaranteed. You can use Gacha Tickets, or DMM Points to roll, but to get every tier is considerably costly. First Time Gacha - A DMM Point only gacha that can only be done once for each cost tier. The page shows the possible rewards which are very good value for their cost compared to normal DMM Point gachas. Limited Gacha - A DMM Point only gacha that appears every few feeks. Typically a 5 roll gacha with added bonus of items. Miracle Gacha - A DMM Point only gacha that appears on special occasions. Costs 5000 DMM Points and guarantees at least 1 SSR. Pickup Gacha - A typical gacha that rotates what Spirit is on pickup either Daily or Weekly depending on the event. You can use Gacha Tickets, or DMM Points to roll. Premium Gacha - A typical gacha that has no pickup. Normal Gacha uses 2000 Gold for 1 roll or 20000 Gold for 10 rolls at once. There is a small chance of SR or higher ranked Spirits appearing, but mostly Affection items and N or R rank Spirits appear. Gacha Tickets are awarded for clearing maps (1 for each World 1 Map, and 1 more for each ☆3 clear) as well as from daily gifts. There is a 55% chance of an R appearing with 40% of that being an R+; 40% chance of SR with 40% of that being an SR+; and a 5% for an SSR. Overall R = 33%, R+ = 22%, SR = 24%, SR+ = 16%, SSR = 5%. Awakening Crystals are obtained when you receive a duplicate of an R or higher girl that you have max Mana Cost Downs, or when you roll a Spirit currently on Pickup. These are used to unlock Awakening Abilities. Spirit Seats are obtained when you receive a duplicate of an R or higher girl that you have max Mana Cost Downs on from DMMpt Gachas. These are used in Abenomics (Refinement). Abenomics (Refinement): allows you to create certain items at a cost using a certain amount of Affection items as points and Gold. Town Revitalization: an expedition-like feature. Grants a small amount of EXP, Gold, and a small chance for bonus items. 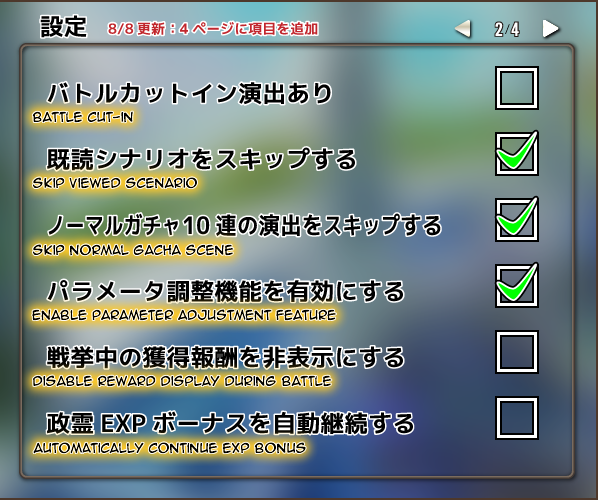 Options: includes the present list to retreive reward items, and settings for in-combat features. 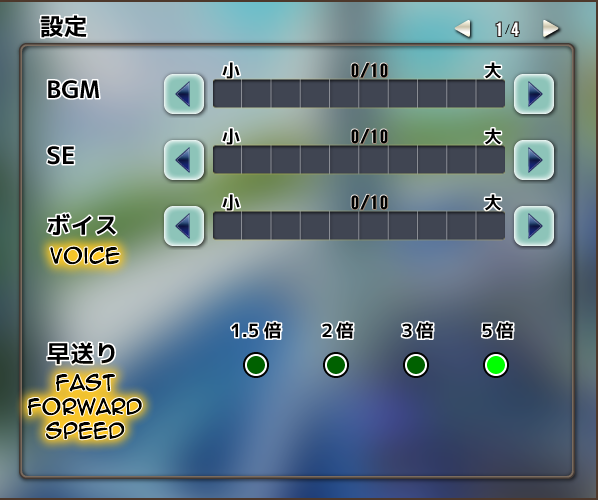 Volume settings for Background Music, Sound Effects, and Voice. Fast Forward Speed setting for the fastforward button and |Space Bar|. Cut-in when you activate a Skill. Parameter Adjustment lets you set your team's level, affection, etc. to a lower amount. This is used for people testing lower level teams when they have higher level ones, and making tutorials etc. Reward Display shows the amount of Gold and the chests you've earned in a sortie. It can be disabled if you dislike it taking up space at the bottom. EXP Bonus costs gold to continue after level 50. You can have it continue automatically so you don't accidentally forget. Your current summoning location is indicated by a blue balloon. Its location above your Castle/Tower can be adjusted from Low to Very High. You can choose to either click on a tower/castle to move the blue balloon to that position, or click on the blue balloon to move it to the next tower. Movement can be controlled by "touching", i.e. clicking, "swiping" i.e. click + hold + drag, or both. Action Circle is a circle that appears around your Spirit where you can quickly choose their Skill, or Boost instead of selecting from the right side of the screen. Pathing options can be set to shortest distance or shorest time, which can vary depending on highways or slow paths, but I believe is not 100% working correctly. When you have a Spirit selected and you click somewhere outside of the path, it can either cancel the character's movement or deselect them. This is useful because the locations you can select on the map are similar to "tiles", but if you cancel movement, you can stop inbetween the selectable "tiles". You can have a Random Secretary setting. The None option gives you your manually selected Secretary, while the others will be Random from those groups. The Motivation Wave can be shown as Exact which covers its full area in a translucent green circle when it appears, or Transparent, which only shows the ring when it appears. The Background image can be set to Chapter 1 or 2 after you unlock Chapter 2. The right panel allows you to select a Spirit and indicates whether they have a 2x EXP Bonus for the day. The unit page displays all the information about a Spirit. You choose which rarity to view at the top, and can select them to be your secretary with the button next to the rarities. The rarities and their level caps are N (30), N+ (40), R (50), R+ (60), EX (75), EXA (100), SR (70), SR+ (80), SSR (99), SSRA (120). These rarities are Normal, Rare, Extra, Extra Awakening, Super Rare, Super Super Rare, and Super Super Rare Awakening. Their weapon name and type is displayed along with their special effects. There are four main types of weapons, Melee, Ranged, Magic, and Heavy. A thorough list is provided further below. 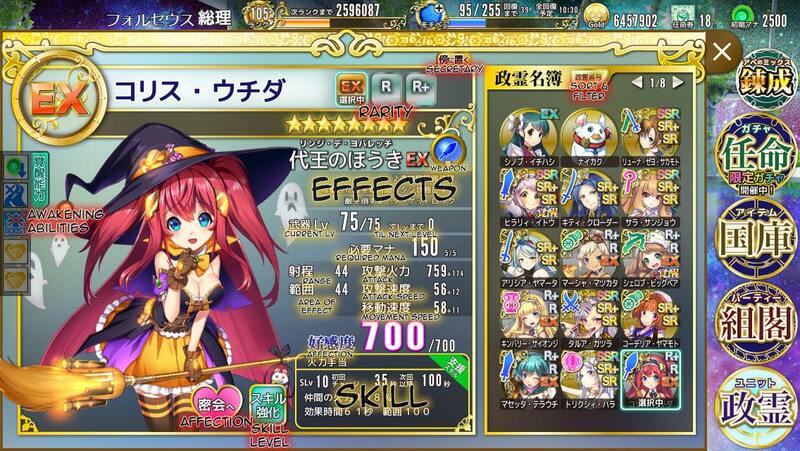 Their current level out of their max level and the EXP required to level is shown next. 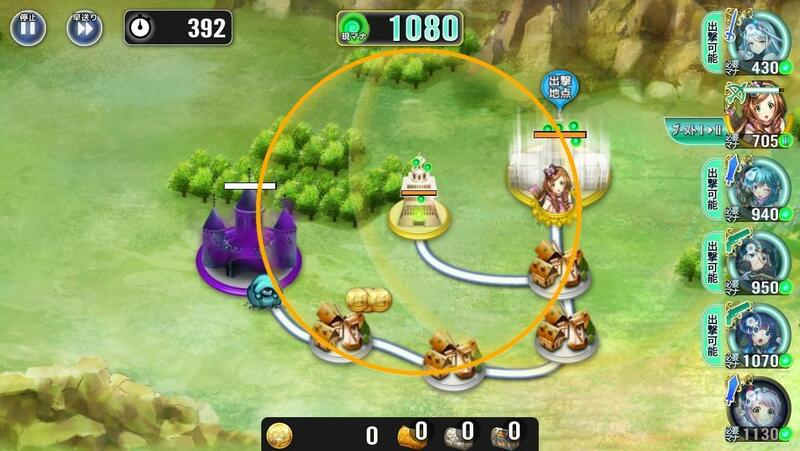 The amount of Mana required to deploy this unit and the number of Mana Cost Downs they have acquired out of their max is shown. These are achieved from getting duplicates of the same rarity. Getting a duplicate lowers the required Mana of a Spirit, and when maxed, further duplicates give Affection items, and if they are R or higher, Awakening Crystals, and if from DMMpt gacha, Spirit Seats. Higher rarity versions of a character have higher Mana Costs, higher base stats, higher maximum levels, and higher EXP requirements to level. EX have inordinately higher EXP requirements due to being event rewards, and are roughly between SR and SR+ in power. EXA are about equal to an equivalent SSR in power. The Spirit's Attack Power (ATK), Attack Speed (ASPD), and Movement Speed (SPD) are shown, including a +X for the bonus they gain from Affection. ATK is the amount of damage they will do before enemy's defense is taken into consideration. ASPD is the amount of attacks they will do in 100 seconds. SPD determines how quickly they will move across the map. In this case, my Colice has 607 ATK + 139 ATK from Affection = 746 ATK per hit. She has 51 ASPD + 11 = 62 Attacks per 100 seconds. Their current Affection level out of their current maximum is shown below, followed by their skill's effect. The left panel has Awakening Abilities. These abilities can be unlocked using Awakening Crystals (ACs) after reaching certain levels with that Spirit. More information below. Skills have a First Recharge timer which indicates how long before the skill can be used for the first time after the Spirit is Summoned. They have a second Recharge timer, or cooldown, which indicates how long before the skill can be reused after its cooldown begins. There are various different skills, some having quick immediate uses for early snipes, while others have long durations for high uptime. Party Buff (Green) - Increases a stat for all allies in range of the effect. Self Buff (Yellow) - Increases stats of the user. Attack (Red) - Deals high damage to enemies in range with some sort of effect (i.e. multiple hits, range, splash, etc). Debuff (Purple) - Deals damage to enemies in range while applying a debuff. Change (Blue) - Changes how the Spirit functions. Special (White) - A skill that does not qualify for any of the above. Skill Levels can be increased using Skill Badges. These come in three varieties: Bronze, Silver, and Gold. Bronze can be purchased for Gold. Silver and Gold badges are typically event rewards. Increasing Skill Levels gives different bonuses for each Spirit, ranging from reducing First Recharge timer, to cooldown, or the strength and range of the skill itself. The max Skill Level is 20. Additional Rarity versions are required to unlock higher levels. All Spirits start at level 10. SR and higher require all Rarities at max Mana Cost Down to unlock level 20. R and EX Spirits only require EX at max Mana Cost Down. Spirits will indicate certain items as 大好物　(Favourites) or 好物 (Likes). N rank Spirits get 10 from base, 30 from Likes, and 100 from Favourites. R rank Spirits get 3 from base, 10 from Likes, and 30 from Favourites. SR rank Spirits get 1 from base, 3 from Likes, and 10 from Favourites. There are four types of Spirits in terms of Affection. Attack-type, Speed-type, Move-type, and Balanced-type; these indicate which stat is favoured from their Affection bonus. There are two unique units, Shinobu and Naikaku, your advisors who can have their Affection increased. Increasing Shinobu's Affection increases your structure's HP, and the rate at which your Motivation Wave occurs, increasing your mana generation in combat. Increasing Naikaku's Affection increases the base Mana you start a battle with. Awakening (Red) - Unlocks the EXA or SSRA rarity and their Mana Cost Downs. Requires EX Level 75 or SSR Level 90. Stat Boost (Blue) - Increases stats of the user. Gear Negate (Green) - Decreases the negative effects of Red Gear, or Twittowers. Companion Boost (Yellow) - Increases stats of the user if another Spirit with this Awakening Ability is in the party. The number of Awakening Crystals (ACs) required to unlock an Awakening Ability and its requirements are shown by its name. The blue button means you have fulfilled the requirements and can unlock it. Depending on the number of Mana Cost Downs that an SSR has, they will have decreased AC costs for their SSRA Cost Downs. They will also receive AC refunds if they gain their Mana Cost Downs at a later point. EXA Spirits have the lower AC cost to begin with and receive no reduction. Click on Spirits from the right side to add to your party list on the left. Dragging and dropping from the right can replace a unit in your party. Dragging a unit in your party up or down can remove them, and dragging them left or right can move their position which only affects the order they appear on the sidebar in combat. You can have up to 5 different parties active, and you can save up to 10 different parties. You can choose the rarity of a Spirit at the bottom of their card which determines which version you sortie with and which version gets EXP. Also known as Sortie (because this is a KanColle forum). 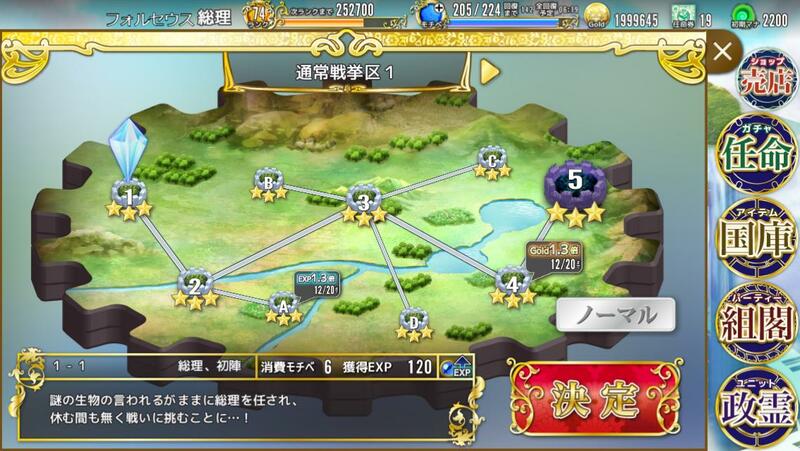 Available maps are shown, and a bubble will indicate if they have a 1.3x EXP for 1.2x Gold bonus for the day. The Motivation cost, EXP awarded and a class bonus is shown near the bottom, which gives an additional 1.3x EXP bonus for Spirits of that class. The final map, X-5 requires you to unlock stars across all numbered story maps. Every numbered map will award a predetermined Spirit for the first clear. You begin at your Parliament (AKA castle because that's easier to say) and can summon units there. The amount of Mana you have is displayed at the top (1080 in this picture), and any Spirits who can be deployed light up on the right, consuming their Mana Cost shown below their potrait. Mana slowly generates during combat, shown as green orbs collected from liberated territories as motivation waves. More is awarded depending on how many Towns and Towers you have liberated. In addition to this, each liberated territory gives off a motivation wave, powering your Spirits and giving you Mana, as shown from the orange circle. You can control your Spirits by either clicking on their unit or icon and choosing where you want them to move. When selected, you can see the Spirit's attack range. While moving, they cannot attack, and they cannot attack while moving. Most melee Spirits will automatically attack enemies they move into range of while ranged Spirits must stop to attack and can move through enemies. Clicking on their portait again can stop a Spirit's movement. Depending on your settings, selecting a Spirit and clicking on an unpathable area on the map can also cancel their movement. You can liberate towns by walking on top of them if they are in range of a motivation wave. They will be an uncoloured gray if this is possible. If they are not in range, they will be purple and cannot be claimed yet. If they are touched by a motivation wave, but fall out of range after, they can still be claimed but cannot generate mana or motivation. You can liberate towers by destroying them with your Spirits. Enemies will spawn from the enemy castle, enemy towers, and holes to assault your towns, towers, and parliament. If an enemy walks on top of a liberated town, it is razed, and must be reliberated. If an enemy walks to a liberated tower, it will attack it until it is razed, and must be destroyed again to be reliberated. Stunning does not stop an enemy from attacking, only moving. If an enemy walks to your parliament, it will attack it until it is destroyed, causing you to fail the map. Your Spirits can attack and will prioritize enemy units over enemy structures to prevent them from destroying your territories. If a Spirit wanders outside of the motivation wave range when it activates, they will gain a red cog which greatly lowers their stats, rendering them nearly powerless unless they can get back in range of a motivation wave. If a town or tower is liberated but falls outside of the motivation wave afterwards, it will remain liberated but cannot generate motivation or mana. Above a summoned Spirit's portrait is a bar indicating the time remaining on their skill cooldown. The First Recharge is faster than subsequent Recharges. 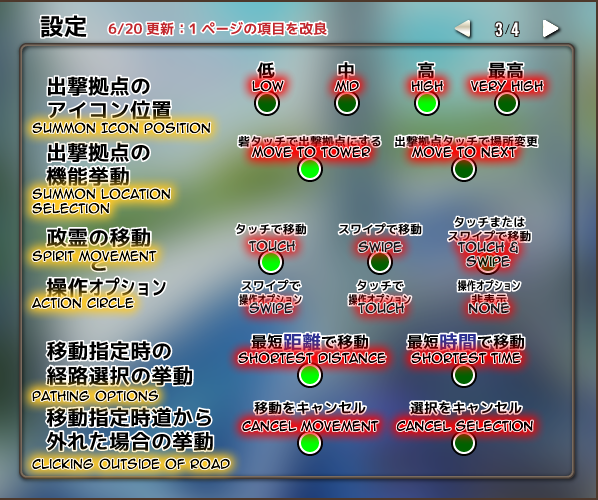 Once their skill is available, it will appear as an upper tab, either Red (Attack), Green (Party Buff), Yellow (Self Buff), or Purple (Enemy Debuff). Mousing over it can show its range and effect, and clicking the tab activates their skill and puts it on cooldown to recharge. The lower teal tab is a Mana Boost. You can spend Mana to strengthen a Spirit up to 3 times. Each time costs progressively more based on the Spirit's base cost. Each boost provides +3.33% ATK, +33.3% ASPD, and +10% SPD for a total of 10% ATK, 100% ASPD, and 30% SPD at max. First boost costs 150% Mana. Second boost costs 175% Mana. Third boost costs 200% Mana. Total boost cost is 525% Mana, plus the original 100% to summon = 625% Mana. It can be costly to upgrade a unit in combat, and it can affect your final score as you are rewarded for keeping a minimum amount of Mana, though it does not affect victory overall. Victory is achieved when the enemy Castle is destroyed, and even if enemies are on the field, they'll disappear. After the enemy Castle falls, your remaining time will be counted with your liberated territories to calculate your remaining Mana earned. There are additional bonuses (stars) awarded for clearing the map without losing a territory (120% Gold) or clearing the map while reaching a minimum amount of remaining Mana (120% EXP). Getting all three stars for the first time (clearing the map without losing territories while reaching the minimum mana) awards you with a Gacha ticket. Furthermore, there is a "Complete Victory" condition, where you earn all three stars under a certain amount of time while liberating all towers and towns. By completing these conditions, you can sortie to this particular map and will always gain the full three star bonus even if you don't meet the conditions again. There are also keyboard shortcuts to select Spirits instead of clicking on them. The number row 1~6 selects a spirit according to that order on the right side. The |S| key will activate the currently selected Spirit's Skill. The |B| key will activate the currently selected Spirit's Mana Boost. The |N| key will change your current deployment location. The |V| key will display your spirit's corresponding number on the map. Holding down ALT and pressing a number will activate that Spirit's Boost. Holding down the SPACE key will activate fastforward. After combat, EXP is distributed to all Spirits in the party, regardless of whether they were summoned or not. The EXP is distributed evenly among the number of Spirits. If a Spirit is at max level, they do not gain EXP and the EXP is distributed among the Spirits who can still level. If a Spirit has a 2x EXP bonus for the day, it can be extended on this page by paying Gold. The Gold cost increases as they level up. If a Spirit has a different rarity version with a higher level, there is a catch-up bonus available. Depending on the level difference, the lower level version can gain anywhere between a 1.5x (1 level) to 4x (24+ levels) increase in EXP. The first page shows the Map base EXP and the multipliers for Daily Bonus (1.3x), Minimum Mana Bonus (1.2x), Silver Map Bonus (2.0x), and any EXP items used (1.5x~2.5x). The second page shows the previous page's total EXP divided amongst the eligible Spirits with the multipliers for Map Class Bonus (1.3x), Catch-up Bonus (1.5x~4.0x), and Daily Double EXP Bonus (2.0x). You can level up Spirits more quickly by sortieing with fewer Spirits in the party, or more max level Spirits in the party. The optimal method of leveling is with only one Spirit who is not maxed gaining all the EXP. The Expeditions of Seimani. Set up a party to go help rebuild the towns that have been damaged by Yato. You can earn EXP, Gold, Affection Items, and Gacha Tickets from this system. You start with 3 slots, and the others can be purchased for increasing amounts of DMM Points. The 4th slot is fairly cheap at 300 JPY. The 5th slot is 1000 JPY and the 6th is 2000 JPY. There are three stats shown below your currently selected party, totalled from the Spirits in your party. These stats are named after the necessities for living. They are 衣 (Clothing, BLUE), 食 (Food, YELLOW), 住 (Shelter, RED). Spirits have points in each stats, but their corresponding colour in this mode indicates which stat has the highest value. Selecting a higher Rarity provides more base stats than a lower Rarity. Mana Cost Downs also increase these points. This means a Spirit with more Cost Downs on a lower rarity may have higher stats than a higher rarity. There is also 平均 (Average, GREEN) which is just the average of all three, indicating the Spirit has roughly an average distribution. Town Revitalization involves upgrading the town's Facilities. Your stat values determine how much EXP you get, which also goes towards leveling these Facilities. Higher stats also increases the chance of Great Success. Higher level Facilities give more EXP, Gold, and chance for Great Success. Great Success gives you the chance of earning Affection Items, Consumables, or Collect Items. 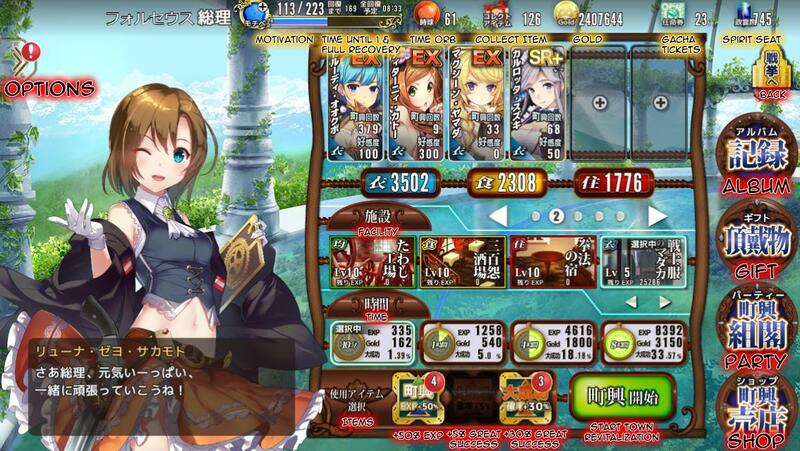 While the EXP isn't high, it can be a moderate source to help level up Spirits without ever having to sortie them. SSRs have will typically give higher stats and thus increase your EXP and Great Success, so it would be convenient to use them for this feautre to (very slowly) level up. By performing Town Revitalizations, a Spirit can earn Collect Items at 10, 50, and 100 total runs. Spirits require an equal amount of Affection to collect these after returning. 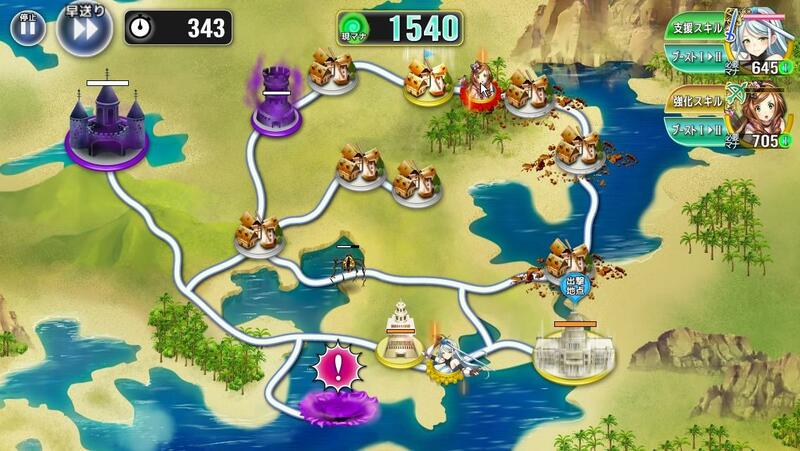 You will be rewarded with Gacha Tickets and Spirit Seats for reaching certail total numbers of Collect Items, i.e. 5x, 10x, etc. Only non-N rarity Spirits can give Collect Items. Great Success also has a chance of giving a unique Collect Item for a Spirit who has 100% Affection and 100+ runs. Leveling a facility awards you with a Gacha Ticket. Maxing a facility gives 30 Spirit Seats. There are also certain radish Collect Items for leveling to 2, 5, 8, and 10 as thanks from the townspeople. Specific combinations of spirits can lead to side stories between them, and certain spirits have unique side stories for themselves. Town Revitalization has different timers available. 10 minutes, 1 hour, 8 hours, and 22 hours. 10 minutes is the most efficient for EXP/time and runs/time, but also most tedious as you have to remember to come back frequently. The longer ones are less efficient for time, but give you more time to do wait inbetween. The +EXP Consumables are also more useful to increase the higher base EXP amount. I believe the longer timers also have increased chances for better items when they get Great Success. Overall, it is typically most effective to sort by a stat and send your highest stat Spirits in to Town Revitalization to level up the facilities, and if you're comfortable with them, send in non-max-leveled Spirits to get them some extra EXP. 5/5 EX Spirits are typically very good since they will have one very high stat, but the extra EXP can be wasted on them if they are maxed level. SSR Spirits are also very good because they tend to have a high stat and they have a seemingly bottomless pit of EXP required that you won't waste any. There are four basic classes of units in the game: Melee (Blue), Ranged (Green), Magic (Pink), and Heavy (Yellow). N-rarity characters are excluded to save space. Some characters have long vowel marks in their surnames, and I believe this is for some pausible deniability in regards to using a politician's name. i.e. Yamaada = ヤマーダ instead of Yamada. I'll simply be excluding these long vowels from their names, though I may miss some. We typically refer to Spirits by their given name anyway. Melee weapons are close range and typically single target and physical damage. All Melee units can stun enemies, which in this game is basically a 99% slow effect. Enemies can still "move" while stunned. Unless the monster is very fast, they are pratically immobile while stunned. Melee units tend to fill the roles of single target DPS, control, anti-ground. A balanced physical weapon with a low cost. Fairly high attack speed with average attack. Good for stunning enemies in place and dealing with lower HP targets. Easy to boost due to the low cost. A high power physical weapon with a high cost. Much higher attack but slower attack speed than the Sword. Very good DPS, especially against higher defense targets. Their Target Lock means they will focus on the first enemy they start attacking regardless of what walks around them, including towers. This means if they get to a tower first and start attacking it, they can focus on it instead of the enemies that spawn. Very similar to the Great Sword but with more DPS. They deal three hits instead of one and attack slower, so they may perform worse against higher Defense. Rin in particular is extremely popular due to her early initial burst damage from her skill. Suu's skill allows her to convert to a Bewitched Blade for a short time, dealing magic damage while having the higher DPS of a Katana. A very unique Melee unit. Extremely low cost, but lower stats overall compared to most other units. Great if supplemented with supporting units that debuff, and can be Mana Boosted very easily to be competitive. The only Melee unit that can pass through enemies without being forced to attack them. They are extremely fast, both in attack and movement. Can be used to capture points early on or snipe enemies. They can deal extremely high DPS, and cost very little, but suffer against high defense. One of the melee units that can deal magical damage instead of physical. They are fundamentally a Magic version of the Katana; however, they cost less and have lower DPS (lower ATK and ASPD) as a difference. Very useful if you need a melee unit to stall while also dealing magic damage. A moderate cost unit. Unlike most other area of effects in the game, the area of effect range is a rectangle shape based around the initial target. Spears are also much slower than all other Melee units, making the DPS lower, but the high base attack and area of effect can compensate for this. A moderate cost Spirit that deals more damage as they continue to attack a target, allowing them to have high DPS if they're focusing a strong enemy. After reaching 15 attacks in a row, it will deal 3.0x damage. The damage is similar in ATK and ASPD to Dual Blades though slightly lower, leading to very high DPS; howver, there is a higher base cost and cannot pass through enemies. Like the Bewitched Blade, they can deal magic damage and is the magical equivalent to Great Sword. However, they have the added bonus of dealing double damage to Sealed enemies, which they can inflict herself with their skill. However, the only other unit that can Seal is an SSR-only Magician. A unique weapon type that can switch between Melee and Ranged every 15 seconds. She has a higher cost than Swords do, but is faster and deals much more damage; however, she's nowhere near as fast as a Gun. A moderate cost unit with middling DPS. She has fairly high base damage for a 2-hit attack. Her DPS isn't super high, but combining the weapon effect with Iona's skill can be powerful. Ranged weapons are long range and can typically target aerial enemies with physical damage. They can walk through enemies but must be idle to attack. Low cost anti-air unit that can be very useful. They have an area of effect of 1, meaning if enemies are stacked on top of each other, they'll all take damage if the bow shoots them; it can be difficult to leverage though due to the way targeting works. One of the easiest methods is to fight on a slow-lane where enemies naturally stack up, combining with Broom to stall in a pile, fighting at a tower where enemies are spawning, or fighting at a tower that's being attacked where enemies are stacking up and dealing damage. Bows are fairly fast, especially the Rs, but they are disadvantaged with the travel time of the arrow, which can mean wasted shots on overkill. A moderate cost anti-air unit with very long range and high base attack at the cost of lower attack speed. She can be very useful for targeting high defense enemies or reaching from a long range. One of my favourites. She has a projectile travel time, but it is very fast and her attack speed makes it so it's never an issue. A moderate cost long range unit. They are the only ranged units that cannot target aerial enemies. Instead, they deal large area of effect physical damage with stun and extremely long range, but at a very slow rate of fire. They've very good for stalling and dealing with large packs on the ground because of this. They have high base attack allowing them to cut past a lot of defense too. They are disadvantaged with their long projectile travel time though, like bows, though they typically don't miss due to overkill because of how slow they are. Often regarded as "the best weapon", guns are extremely high DPS and well worth their higher cost. Their ATK is on the lower side, but they have such extremely high ASPD values they can burst through the vast majority of situations. They are only thwarted by high defense enemies and their shorter range. Kirara is often seen as the superior gun due to her skill giving her extra range. A very high cost unit with extremely high range, matching that of Cannons. However, she has a unique limit of a minimum range where she cannot attack units from. Due to this, she is very difficult to handle, requiring constant monitoring. She does extremely high damage giving her powerful nuking potential, but her unique range and the targeting system in the game can make it extremely difficult to make her hit what you want. A rather low range weapon type with a moderately high cost. They have a fairly high attack speed allowing them to stun their target extremely effectively at range. A moderate high cost magical ranged unit. The another unit that can stun aerial enemies, they're statistically like a fast magical version of a Crossbow, though there is no SSR Crossbow, it would be similar. A highly useful ranged unit with strong magical DPS and high range, especially if you don't want to field a Magician. Dual Pistols are basically lower cost, lower range guns. Their damage per hit is also lower, but they attack twice and have more than half of a gun's attack speed. The lack of range can be limiting and defense will hit them harder, but the lower cost can help compensate compared to a regular gun, as well as use of their skills. A high cost area of effect weapon. She does fairly low DPS, but she can stun packs of enemies, even aerial ones giving her a unique niche dealing with groups, which a lot of ranged units fare poorly against. A moderate cost support unit. In attack mode, she can seal enemies in a 48 range while dealing single target damage. Her basic stats are like that of a Throwing Blade, which isn't too bad. This in particular allows her to support with Magic Stone to deal more damage, while protecting towers from flying enemies as you wait for backup. In support mode, she can reduce the cooldown of the nearest ally by 1 second each time she attacks, which can get very fast at high levels. This can be very powerful with certain combinations. Staves hit a wide area and slow enemies. They are very good at clearing large groups that are more spread out, but don't do a lot of single target DPS. Very similar to Staves, but with much smaller range and area of effect. They have lower DPS but compensate with the Curse debuff, allowing your faster/multihit Spirits to deal more damage. Their slow is less powerful than Staves. AKA Magic Weapon. The second strongest Magic in the game with a slow but powerful attack and very high cost. Extremely strong at nuking targets down, but can waste attacks on weaker enemies or groups that aren't stacked, such as targeting a monster exiting a tower and missing the tower itself. One of the best Spirits in the game and can carry many maps if timed correctly. Very similar to Staves but with slightly smaller range and much smaller area of effect. Their slow is more effective and they have higher attack speed and slightly lower cost in return and can be more useful if the extra range and area of effect is not needed. A higher fire power version of a Staff. They have more range but less area of effect and deal higher amounts of damage leading to more direct DPS; however, they cost much more mana. A lower scale version of Magical Ordnance. They have a very low area of effect but much higher attack speed and slows enemies. Their DPS isn't as high as Ordnance, but much higher than the high area of effect magic and their low cost makes them very versatile. The lowest cost magic unit. They have a small area of effect, but larger than Ordnance and Rod, and have high attack speed like Rods. Their single target DPS isn't as high as Rods, but they have a larger area of effect and base damage allowing them to hit harder through defenses. They are very versatile and effective due to their speed and low cost. A very powerful unit against few targets. They have a high cost, but high damage. They have better area of effect than Ordnance and Rod allowing them to more effectively hit scattered targets, but have a target limit of 3. Their unique ability to stun makes them very effective at taking out high priority targets too compared to other Magic units. The damage is divided to 2/3 for 2 targets and 1/2 for 3 targets before defense is considered. Technically the strongest magic in the game, there is the caveat of needing the target to be Cursed to deal maximum damage. If they are, the damage surpasses Magical Ordnance, but otherwise, she deals a bit more than half the damage while having much greater area of effect and less range. The projectile speed is also better than Magical Ordnance, allowing easier control. An SSR only weapon type. She does not have exceedingly high DPS, but her Seal allows her to weaken enemies to protect towers and parliament. Her skill allows her to teleport to defend them immediately too. The reward for completing the final stage of the story mode. 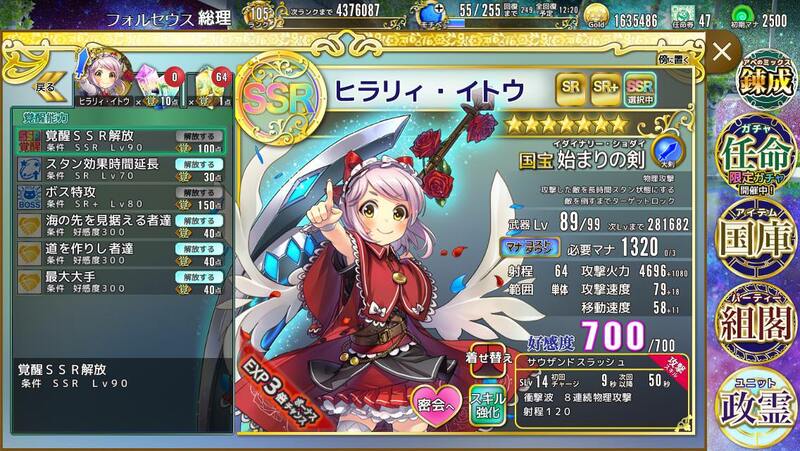 She has a constant 500 ATK which is her healing stat, and leveling her increases her attack speed and movement speed. Her skill buffs party members' Attack to 110% for a fairly long amount of time, 40s, with 60s cooldown, and 250 Range. This can allow for unique strategies where tanking with a tower is possible. A moderate cost SSR only weapon. Similar to the Key, her DPS isn't strong. However, her skill allows her to copy the closest allies' skill, letting her replicate some of their effectiveness. A moderately high cost magic weapon. The 5 debufs are Stun, Weaken, Slow, Armor Break, and Seal. Her skill applies Stun, Weaken, Slow, and Seal, allowing her to use her effect as well. The bonus damage is +50% per debuff, allowing her to deal a lot of damage. Her base DPS alone is higher than Rods while having the same range and area of effect, with better speed making her more flexible, and higher base attack allowing her to hit through defense better, though her cost is higher. Last edited by Folseus; 11-06-2018 at 01:04 AM. Heavy weapons are close rang and deal area of effect physical damage. They are typically much slower than Melee weapons while doing higher base damage. Simply a slower physical attacker that can hit multiple targets. The base damage allows them to hit through more defense, but their speed can allow certain enemies to pass through their stun. An extremely effective weapon against tightly packed groups as they deal more damage when hitting more targets to no limit. For every enemy they hit, they deal +15% more damage, starting at 1.15x, then 1.30x, etc. Very effective when placed on top of holes or towers that spawn many enemies, but due to their range, it can be difficult to position when enemies are in the way since they won't be able to get close enough to hit more enemies. The damage scaling allows them to take on a lot of enemies very quickly. Their Armor Break allows them to pair well with other fast physical attackers and compensates their 2-hit attack's lower damage. They're better for general use than Razors and similarly effective against weaker multiple targets. A very slow weapon type, but uniquely have the effect of Mana Boosts increasing their area of effect. 1 = 1.5x, 2 = 1.75x, 3 = 2.0x. This allows them to have an extremely high area of effect if you want to dedicate the Mana to it. Their slow attack speed can be an issue, but their high base attack can allow them to go past armored enemies. Another slow high cost powerhouse type weapon. The Scythe effect increases damage based on how far away the enemy is when attacking, dealing normal damage at range 0~24, 2x at 25~48, and 3x at 49~80 range away. The slow attack speed may prevent her from being able to stall enemies very effectively, but the high damage per hit can be useful to kill enemies quickly preventing the need to stall at all, and can be effectively combo'd with other units with faster stuns, and spawning or static positions such as towers, holes, slow paths, or crossroads. A moderately low cost support type. 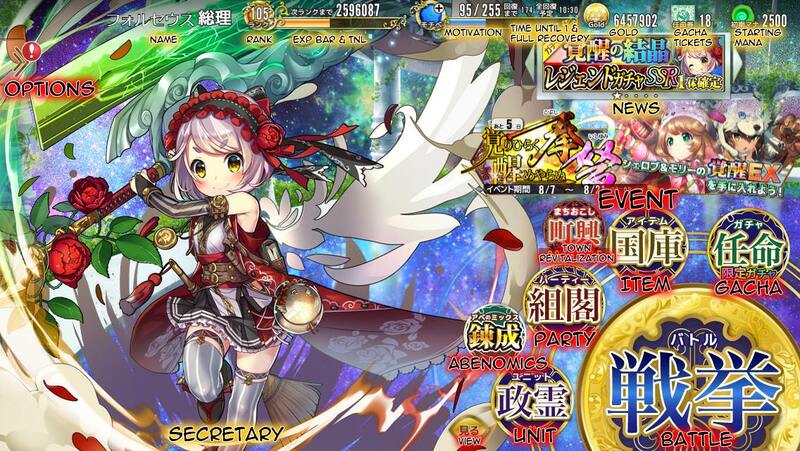 Her skill gives a free mana boost to the nearest ally, making it quite powerful when combined with high cost units. She also deals magic damage which is the first for Heavy types, though her DPS isn't very impressive. Her low cost allows her to be flexible in a supporting role. There are various types of enemies that can attack you, with varying effects. Some enemies are immune to status effects if you're too low level. The ones listed in the official gallery are shown here. There are red versions of enemies that are especially strong, having more HP, DEF and dealing more damage, as well as boss monsters that are uniquely powerful for their map. Most common enemy type. Very easy to defeat. Second common enemy. Tougher defense than Eyes, but not resistant to magic. Tend to come in bigger packs. Very fast enemy that will tend to rip through your towns. Be ready to stun them with a fast melee unit to snipe them. Low HP and DEF but can get away quickly. Very high PDEF but vulnerable to magic. Extremely slow moving. Very tough high HP enemy. Typically requires dedicated DPS and stun to take out. Resistant to magic and status effects. Can be trouble if you rely on too much stun, but physical units are decent against it. Immune to all status effects and has very high MDEF. Can be very deadly if you don't plan ahead with physical DPS. Generic flying enemy. Very weak to physical attacks. A very high defense flying enemy that can deal a lot of damage. Magic or extremely high PATK is necessary to take them out. A very slow high defense enemy that has a long range attack. Basically a cannon. Be careful they don't snipe your towers. Magic or high PATK can take them out. A faster enemy type that's immune to Curse, but weak to physical attacks. A weak flying enemy that gives speed buffs to others if left alone for too long. Easy to kill with physical attacks but be careful of that boost. An extremely tough enemy that requires high ATKs to break through, both physical or magic. It's immune to slow, stun, and seal. A very weak enemy whose purpose is to give you an extra 1000 Mana when killed. If they walk into a liberated tower or parliament, they explode on their own, but they can still raze towns. You can take them out early for the Mana sooner. A very weak flying type enemy that tends to come in big waves. Very easy to take out. An extremely high PDEF enemy that can't be stunned; however, physical attacks cause it to go into its shell and stop for three seconds, doubling its already high defense. You can slow it down with a fast physical attacker while your magic does the damage. There are typically two types of events. Siege: A time-attack style event where you earn points based on the amount of time left when you destroy the enemy castle. Subjugation: An elimination style event where you earn points based on the number of enemies you've defeated when time runs out. Alongside these two event types, there is also a 12-member party type event, which can be mixed with either of these. This mode allows you to use two parties together for up to 12 spirits at once. Only the leader of your first party has access to her skills in this mode. There has also been an event where you are limited to 4 units, one of each weapon type. What happened to the previous thread? Also just started playing but those 50% gatcha rates definitely only apply to the 11 gatcha roll. SRs aren't rare but they're hardly 50/50 either. Last edited by Folseus; 06-01-2017 at 12:59 PM. Whole website got rolled back, apparently. If you got really bad rolls, I suggest making another account to just re roll a bit, lol. Having SSRs and SR+s breaks the game once you level 'em a bit. Leveling can be pretty slow even on the rate up maps for each type. I've tried. Rolled some good SR+s but never rolled a SSR yet. That silver loli is awesome, pretty much completely a boss killer character considering her damage is like 5x the average character. What's bothering is the whole level cap difference between ranks. Right now aside, feels like later on you'll get screwed over if you don't have a few SR+s and SSRs to use. Two questions though, what causes your units to turn red and become useless? And once we clear all maps, does that mean no more tickets for now? @Serian Hmm which silver loli. I am afraid i never had my character turn red and useless. Some SR+ are good but SSR cost is pretty forbiding to use most of them. If the vost is 1100+ they will be hard to deploy. The one at the 11 gatcha roll cover. She's a mage but has little AoE, instead she creates 5 balls and bombs a single target with them every attack. Every ball does full damage and she has 1000+ attack. Her skill generates something like 20 balls instead so... yeah. @Glasses The SSR bismarck gunner is 1110 and I wait 1 second then insta summon her first. She is a beast, honestly, and can solo for a while on most maps. @Serian The red is caused by if you advance too far outside of your 'territory'. You have to capture houses and castles, otherwise when you advance you get the red nerf of doom. All your territories generate Mana. You can see the radius that they reach when they do this. Girls outside this radius lose their power, becoming slowed and weakened. Ah, so that's why sometimes my units would suddenly stop. Thanks. So out of curiosity, what's the plot of this game about anyway? @Vz-Rei Ha, now that you mentioned her, I just rolled her. What makes her different from other gunners though?